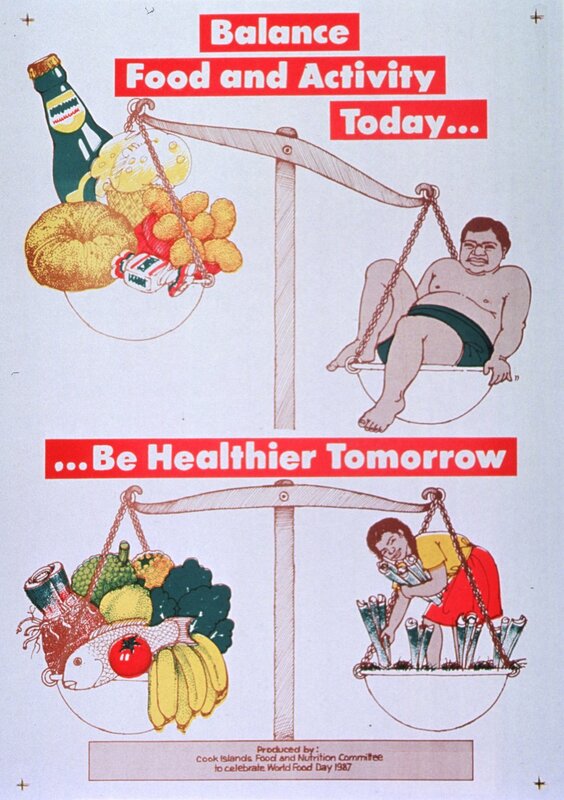 A 1987 poster from the Cook Islands Food and Nutrition Committee suggests that we Balance Food and Activity Today… [to] Be Healthier Tomorrow. At the top of the illustration, high-fat, high-calorie foods like donuts and candy tip the scales in the direction of obesity, portrayed by the sedentary figure on the right. In the scale at the bottom, fish, bananas and other healthy foods are in perfect balance with the active woman harvesting vegetables. This whimsical representation of eating and exercise is part of NLM’s Prints and Photographs collection. November 1, 2008 in Collections.